A class suited for beginners as well as long time practitioners. Jo Caron is a certified Kripalu Yoga teacher from Kripalu Center for Yoga and Health in Massachusetts where she lived as a full time resident for several years and taught yoga classes, meditation and self-development workshops. Cost is $10 per class. For more information call Jo at 443-6993. Please forward this to Jo Caron. 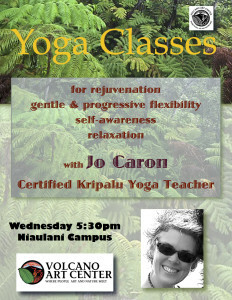 I wish I had met you sooner as it would have been a joy to experience a Kripalu yoga class. Maybe our paths will meet again as I’m eager to find house sitting jobs (where ever life opens to) come June.